Check out that bizarre cover art! This is Italian prog of the highest calibre, and sadly this is their only album. A notable feature of this album is the inclusion of only drums, keyboards and vocals. Their sound however, is remarkably full as there are a LOT of keyboards. Another notable feature of this album is the terrible, terrible vocals. Even going by the relatively low standards of Italian prog, these are pretty damn bad. Fortunately the singing mistake isn’t quite enough to ruin the album, which is top notch bombast, memorable melodies, and an enormous load of sweet Mellotron. The first two tracks on this aren’t all that good in my opinion (with some seriously comedic singing on “Icaro”), but things really get going after that. “Un Cane” opens up with a short piano introduction and then some super fat synth comes out of nowhere. “Dolce Sorella” features a nice melody and finishes with a solo that would make Rick Wakeman proud. The rest of the album is more of the same- a synth lovers dream. 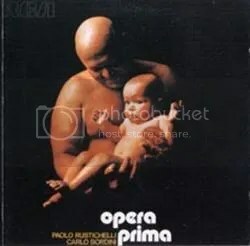 One of the best of the Italian 70’s if you can tolerate the singing. A minor historical note: Bordini would play the drums for the Cherry Five a couple of years after this album was recorded, the band that would later become Goblin.